How to generate reports within AdWords. How to measure the performance of your AdWords account. Performance of your AdWords account can be analyzed by generating various reports available right within the Campaign tab, under the specific metric you are looking to track. 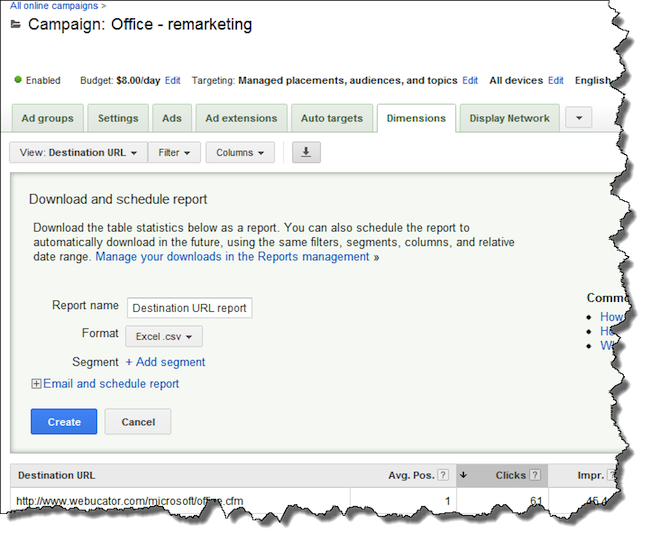 Google recently moved the reporting functions from the Report Center tab to the Campaign tab. If your account previously had created reports, check out this Google Help Center link: http://adwords.google.com/support/aw/bin/answer.py?hl=en&answer=177116. Keyword Reports Information on how your keywords are performing across all campaigns or in selected campaigns. Ad Reports Information on how specific types of ads are performing, including text ads, image ads, video ads, mobile ads, and local business ads. Destination URL Reports Shows performance of destination URLs. Ad Group Reports Allows you to focus on performance of Ad Groups for one or more of your campaigns. Campaign Reports Shows statistics for each of your campaigns within an account. Account-level Reports Allows you to generate statistics for your entire account, or for a portion of your account. Demographics Reports This report is available only on the Content Network and it shows data related to demographic composition of the users who view your ads on participating publisher sites. Geographic Reports Shows performance of your ads by visitors location, as identified by the geo-tagging system. Search Term Reports Shows data related to the search queries which triggered your ads. 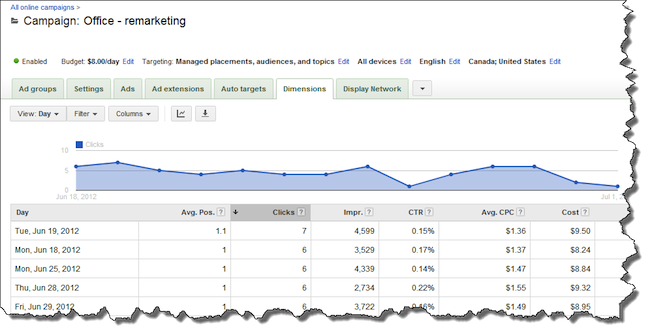 Placement Reports This report shows performance of your ads on specific domains and URLs in the Content Network. Navigate to your Campaign tab. Go to the desired campaign you would like to run the report on. Please note: You can also run a larger report showing all running campaigns - just skip over choosing a specific campaign. Across the top, if the desired report is shown as a tab option, click that, and go down to step #7 below. If it is not shown, such as the Destination URL report, continue to the next step. Go to the pull-down menu after the Audiences tab. Choose the Dimensions tab to make it viewable. Open the Dimensions tab and chose the appropriate report from the View pull-down menu. After determining you have created the data for your report, click the downward arrow icon, which opens up the reporting module. Chose the appropriate name and download format. Chose any additional segments you would like to include in the report. Chose the Email and schedule report option and determine your preferred download methods. Let's practice by generating a report to analyze the performance of destination URLs. Click the Campaigns tab and then select the campaign you would like to run the report on. In this example, we'll use a Microsoft Word campaign from a demo account. If the Dimensions tab is not shown, use the pull-down menu, far right, to make this tab viewable. At this point, go in the View pull-down menu and choose Destination URL. 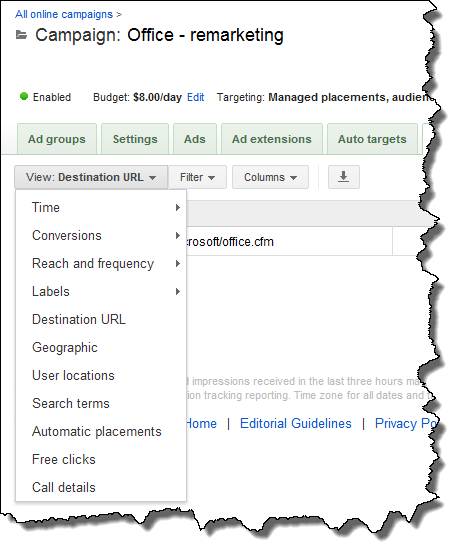 Now, the appropriate destination URL(s) will show up in your report window. Simply click the downward arrow, far right, to activate your desired report. In this section, you can select how you want to save and share your report. Take a look at the following screen shot to see the available options. If you plan to tweak some parameters in your report, then it is recommended that you save your report as a template. Click on the Create Report button when you're done to generate the report. Click the Campaign menu and then click the Ad groups tab. At this point, you can begin running a report on all active ad group (default) or you can chose a specific ad group, listed at the bottom of this module. Select the Download Report option across the top toolbar, notated by the downward arrow icon. Then select a report name and download format. Add any desired segments you would like to include in this report. For this exercise, we would want to add appropriate desired segments, such as: Hour of day, Day of the week, Day, Week, and other time-related segments, as needed. Click Email and schedule report and choose the desired report output method. At this point, you can begin running a report on all active campaigns (default) or you can chose a specific campaign, listed at the bottom of this module. From the View menu, select the Geographic option. Add any desired segments you would like to include in this report. For this exercise, we can leave this alone. Let's spend some time and develop a few reports based on hypothetical situations. You would like to know how many people saw your ads within a particular ad group and how many times they saw them over a certain period of time. Generate a report that will show this metric. You would like to identify different regions where your online marketing campaign has been effective. Generate a report for a particular ad campaign to pull up this information.